After Melanie got her sneakers on the World Wide Web, certain of my former male teammates began demanding equal time for their sneakers on the Internet. Who am I to refuse? Several of my former teammates had various running and cross-training shoes from the New Balance 600 series: models 600, 606, 607, 608, 620, 648, 650, 655, 656, 657, 658, and 659 come to mind. Several people had New Balance 606's, but I have to admit... I'm the only one with a brown pair! Bill found that he needed a less cushy running shoe than a pair of Nike Air Max. He got a pair of ASICS GEL Kayano shoes to keep things stiff and stable. Bill found that running was too hard on him and he had to have some foot surgery. For a while, he was down to wearing a pair of Nike Air Deschütz sport sandals around work! He's had these Nike All Court sneakers for a good long while. Gary told me a story about these Nike All Court sneakers. It seems they were literally bought for use as "sandshoes." He won an employee contest when he was working on the Space Shuttle in 1982. His prize was a trip to Hawaii. Jack played high school basketball back in the days when Chucks reigned supreme. Over the years he's been on Space Station he has had several pairs of sneakers he wears into work, including pairs of black Converse "Chuck Taylor" All-Star low-top and high-top sneakers, a pair of beat-up white and Carolina blue adidas Superstar, a pair of Nike, and a pair of ASICS. Jack, like Charlie, is now retired. Jim is from Oregon, the home of the Umpqua and the Deschutes (two rivers that Nike used for naming their sport sandals). So, it would be appropriate that Jim is a Nike fanatic, and he is. Jim is not only a Mac addict, but also a Pepsi fanatic. (Being much less of a Yankee than Jim is, I prefer a Coke any day.) Jim is so much of a Pepsi fanatic that (with some help from throwing some pool parties) that he got a pair of "Pepsi Stuff" Teva sport sandals! He keeps complaining almost everyone in our organization has more age, experience, and accumulated wisdom. Therefore, several of us call Stephen "Young Stevie" as a joke. He has this irrational belief in extraterrestrial automobile manufacturing. Young Stevie had a new car. When he got it, he told me it came from Saturn. After checking with the experts at NASA, they tell me there are no life forms on Saturn capable of making automobiles. I did a little research and found his car really came from Tennessee. Young Stevie wear sneakers to work? Only on the weekend! (He was one of the few people in our building that wasn't in management who wore a shirt and tie to work.) He has a pair of dirty New Balance 999 running shoes. Young Stevie is the typical penny-pinching engineer. I tell him he ought to buy a pair of Converse "Chuck Taylor" All-Star sneakers so he would have some a pair of true classics. He tells me he's too broke. One of my writers told me (indignantly): "That guy Steve is either blind or a recluse." Just because he asked me "What are Chucks?" 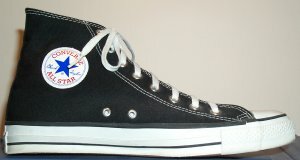 Young Stevie has an even younger brother who performs in a rock band... wearing black high-top Chucks, of course! Young Stevie has a pair of New Balance 999 running shoes. They have been everywhere from SA (Southern Alabama) to the SA (Swiss Alps). He told me they've also been to England and Mexico.